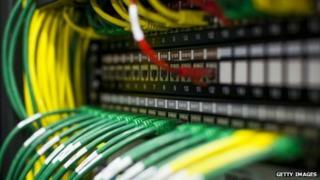 Browsing speeds could slow over the next week as old hardware is upgraded to handle the net's growth, says networking giant Cisco. Some older kit has hit an upper memory limit in the number of routes it can use to despatch data around the world. In the last few days the number of possible routes breached that upper limit which might mean those routers start to struggle. Already some firms are reporting users are having problems. The problem has emerged as the number of connections between the different networks that make up the internet has continued to grow, wrote Omar Santos from Cisco in a blogpost. Routers, which send data around the net, keep track of all the ways data can travel via an internal log known as a routing table. This list is constantly updated according to the ebbs and flow of internet traffic. This week the number of entries on that global routing table went past more than 524,000. That represents a growing problem, said Mr Santos, because five separate devices Cisco makes can only handle a routing table of 524,288 entries. As more and more routers around the world have to support 512K entries and beyond, the potential problems will grow, said Jim Cowie from internet monitoring firm Renesys. "512K is right around the corner for everyone on Earth, as early as next week," he wrote in a blog post, adding, "this situation is more of an annoyance than a real internet-wide threat." Routers that hit the memory limit could slow down, lose data or crash. So far, said Mr Cowie, there was little evidence that the 512K problem was bringing about any more disruption than Renesys normally sees. However, hosting firm LiquidWeb blamed the 512K bug for service disruption that hit it on Tuesday and it is also thought to be instrumental in causing problems for eBay, Comcast and Time-Warner. Paul Lettington, network architect at UK ISP Andrews and Arnold, said workarounds did exist for the bug that should help older kit cope. Cisco has also published advice for owners of vulnerable hardware. Andrews and Arnold had only seen indirect evidence of the 512K bug starting to bite, said Mr Lettington. "We have seen anomalies with other networks on the internet which could have been caused by it, and these may have had an effect on our customers accessing those other networks," he said. He added; "It is unlikely that any network operators will step forward and say that they were affected by it, as it would require admitting that they are running older, less capable hardware and are not on top of managing the maintenance of it." Roland Dobbins, a senior analyst at Arbor Networks, said the too-many-routes problem had emerged twice before when the number of routes surpassed 128K and then 256K. At both times unskilled and smaller organisations were caught out as hardware struggled to cope. A similar situation may recur this time, he said, because skilled engineers who know about the limitations of ageing network hardware were still rare. "This may come as a surprise to non-specialists who view the internet as a high-tech affair comparable to the bridge of the USS Enterprise of Star Trek fame," he said. "In actuality, the internet is more akin to an 18th century Royal Navy frigate, with a lot of running about, climbing, shouting, and tugging on ropes required to maintain the desired course and speed."